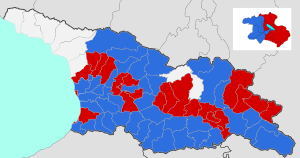 Presidential elections were held in Georgia on 28 October 2018, the seventh presidential elections since the country's restoration of independence from the Soviet Union in 1991. The previous elections in October 2013 resulted in a victory for Giorgi Margvelashvili, a candidate of the Georgian Dream coalition. Following amendments to the constitution in 2017, the 2018 elections will be the last direct presidential vote; after 2018 presidents will be elected by the 300-member College of Electors. In view of these changes, the President will be elected for a term of six years in 2018. A second round involving Salome Zurabishvili and Grigol Vashadze was held on 28 November 2018 because no candidate was able to secure at least 50% of the vote in the first round. Salome Zurabishvili won with around 60% of the vote in the second round and took office on 16 December 2018. The pre-election campaign was marred by a polarized political environment and a series of secret tape recordings aired by the pro-opposition Rustavi 2 TV, leading to allegations of kidnappings and torture by investigators to secure convictions, pressure and coercion on businesses and media, high-level corruption, and selective justice. International observers assessed the elections as competitive and free, stressing that "one side enjoyed an undue advantage and the negative character of the campaign on both sides undermined the process", while the misuse of administrative resources "blurred the line between party and state." 46 people applied to participate in the elections, 21 of which were rejected by the Election Administration of Georgia. 25 presidential candidates were registered by the Election Administration of Georgia. This is the largest number since Georgia's first presidential election in 1991. All 25 candidates were included on the ballot paper. Nino Burjanadze, Georgian politician and lawyer who served as Chairman of Parliament of Georgia (2001-2008). She has served as the acting President of Georgia twice. She backed out of the election on 8 September. Giorgi Margvelashvili, incumbent President, officially refused to take part in the election in late August. The Parliamentary Assembly of the Council of Europe stated that the elections were "competitive and professionally administered," but noted concerned about a "substantial imbalance in donations", "excessively high spending limits", and a "lack of analytical reporting" as contributing factors to creating an unlevel playing field. On 29 November, the second day after the run-off results were released, the United National Movement leader-in-exile Mikheil Saakashvili encouraged supporters not to accept the election results and to hold demonstrations against the newly elected president. He also called for civil disobedience toward the police and armed forces. ^ "Certified Official Results of the 28 October 2018 First Round of the Georgian Presidential Election" (PDF). Central Election Commission (in Georgian). Retrieved 14 November 2018. ^ "Key Points of Newly Adopted Constitution". Civil Georgia. 27 September 2017. Retrieved 9 December 2017. ^ "Second Round of Presidential Election will be Held on November 28". Central Election Commission. Retrieved 14 November 2018. ^ "Results 2018". Central Election Commission. Retrieved 29 November 2018. ^ "Georgia's tapes scandals suggest something is rotten at the top of Georgian politics". OC Media. 17 October 2018. Retrieved 6 January 2019. ^ "Georgia's First Woman President Sworn In Amid Opposition Protests". Radio Free Europe/Radio Liberty. 17 December 2018. Retrieved 6 January 2019. ^ "Presidential Elections 2018: Weekly Digest No.2". Civil.ge:. 25 September 2018. Retrieved 12 October 2018. ^ "Presidential Candidate Zurabishvili Claims Georgia Started August 2008 War". Georgia Today on the Web. Retrieved 2 October 2018. ^ "Nino Burjanadze boycotts presidential election". Interpressnews. 8 September 2018. Retrieved 9 September 2018. ^ "Current president Giorgi Margvelashvili not to run in presidential elections". Agenda.ge. Retrieved 5 October 2018. ^ "Goodbye, Mr. President". Georgia Today on the Web. Retrieved 5 October 2018. ^ ¢Voters had a genuine choice and candidates campaigned freely, but on an unlevel playing field, international observers say Parliamentary Assembly of the Council of Europe, press release of 29 October 2018. This page was last edited on 2 March 2019, at 11:32 (UTC).